I love writing so much that this year I have taking on the biggest writing project yet. 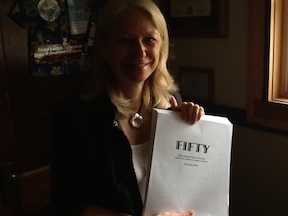 A memoir about my adventures of when I turned 50. Turns out though, that I only have so much time to fit in writing so some of the articles that I would like to put together will have to wait. If you want to connect, please feel free to email me at annie@practicehow.com. Hopefully you are out there finding your own adventures and living the life you were meant to live. Posted in 50/50 Adventure on July 31, 2014 by annie zirkel.